Description: Vanilla Pipe Tobacco has been completely reformulated from its original incarnation while preserving a general similarity and using several of the same notes. It is offered in a rice bran carrier oil in lieu of perfumer's alcohol. This blend contains vanilla fragrance oil, tobacco absolute, tonka bean absolute and sweet clover absolute. It is a much lighter, smoother and sweeter blend with tamer tobacco notes and heavier vanilla. On cold sniff and initial application, a sweet, dry tobacco note blooms on top of a beautiful vanilla base. The divine vanilla becomes stronger the longer this perfume is on the skin. The coumarin hay-like note of sweet clover absolute paired with warm tonka bean adds a dimension to this scent that makes it smell exactly like a sack of moist fresh vanilla flavored pipe tobacco. It is truly exquisite and a must try for anyone looking for a realistic and wearable pipe tobacco fragrance (unlit, not smoky). The longer Vanilla Pipe Tobacco wears on the skin, the sweeter it becomes. Vanilla Pipe Tobacco has good tenacity but hugs closer to the skin. It is a very pleasing authentic scent that is amazing worn alone or for layering. Unisex. You may notice small black flecks suspended in this blend. These are simply small bits of tonka and sweet clover absolutes and nothing to be concerned about. THIS FRAGRANCE COMES IN A CLEAR 5 ML ROLL ON BOTTLE IN LIEU OF THE COBALT 5 ML BOTTLES PREVIOUSLY USED TO HOUSE THE PREMIUM FRAGRANCE LINE. WOW! This was a lovely win. I found the original version fascinating, but it was a bit too realistic a portrait of an actual pipe for me to wear it comfortably. This version is just as rich and sweet, but is somehow smoother and much more wearable. The last version was like a smoking jacket and cravat, this version is much more casual--like a comfy cardigan. I wasn't sure what to expect with this one. I own Tom Ford tobacco Vanilla, Guerlain Spirituese Double Vanille and Odori Tabacco, so I was really thinking that I have as many variations on the tobacco and vanilla themes as I needed. I was wrong. Yours is a unique spin on this genre as well. One of the things that I'm coming to appreciate about your skills Angela is your unique take on ingredients, it has actually surprised me. No wonder you feel proud of your achievements. What I enjoyed particularly about Vanilla Pipe Tobacco is how you have brought out a very naturalistic pipe tobacco - just like my great grandfathers pouch of tobacco. I have now used this tester up with three applications and find the heavier application best. It was most suited to the evening as it was getting dark (mood wise at least). I would like to have tried the older blend - for me I think a bit more roughness would have taken me closer to Grandfather. Again an exceptional fragrance that I will order in the future based on this sample. How very similar to Alkemia’s Miel de Sauvage et Tabac but much weaker and dries down fast. The drydown is a bit like a sweet ashtray. Disappeared in 2 hours. I have to say it's an amazing scent, because I love sweet creamy tobacco scents so much. Too bad it doesn't work on my skin in term of silage or longevity. I would definitely recommend this to a tobacco lover, though. Absolutely addictive and my top favorite from all of SS that I have sampled thus far! A perfect fragrance. I don't know how else to say it. A pure, gleaming golden vanilla paired with a soft chewy tobacco. The overall aroma is absolutely stunning, a delightful masterpiece that I can't get enough of! The natural essences do vacate the skin within a few hours, so I just bring it with me and continue to re-slather throughout the day so I can constantly inhale its decadent beauty in a haze of pure bliss. The vanilla is true to life, pure vanilla extract. And the hint of clover really makes the shooting stars sparkle in my eyes. I understand now why so many people love this scent. It's very unisex, and has notes to appeal to both genders. 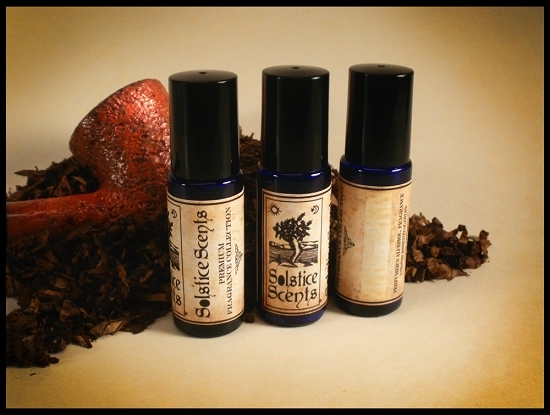 Unlit pipe tobacco and vanilla, what's not to love!? Sadly, this one is very faint on me, and in 2 hours I can no longer smell it at all. It may be stronger in the edp, and that would be worth looking into! But either way, this scent is so lovely I can stand to reapply. This is for the EDP. Wow, chewy is an excellent word to describe Vanilla Pipe Tobacco. As an non-smoker (3 years running, woot!) I was super worried about wearing Vanilla Pipe Tobacco and getting cravings. Pipe's were never my thing, but I always enjoyed the smell of them (not the smoke, the tobacco). It starts out smelling like the inside of a humidor, one filled with expensive tobacco. This isn't the cheap stuff. This is quality grade, sticky, chewy, dried tobacco. Freshly cut. Drying from soaking up some premium vanilla. If scent were a color, it would be a deep golden brown. As it wears the humidor aspect fades as does the strong tobacco scent and you're left with a golden vanilla with just a hint of tobacco. I don't know much about tobacco. I've never smoked and cigarette smoke makes me have a bad allergic reaction where I can't breathe and start getting dizzy and sick to my stomach. My mom has always smoked. When I was little, it was Newports. My cousins and I would sometimes steal one of her cigarettes and tear it open to pick the little dry pieces of tobacco out (was that even tobacco? I don't know, lol). Anyhow. Parts of Vanilla Pipe Tobacco remind me of that - the crisp, dry paper and strangely sweet, dry scent. It also reminds me of walking into tobacco shops that sold a variety of chewing tobaccos and pipe tobaccos along with my mom's Newports. It's all of the tobacco and honeyed sweetness and none of the smoke, which I am grateful for. I don't know if I even like this, but it reminds me of my mother's Newports and my father's sweet chewing tobacco. In a strange, sad way, it reminds me of my childhood and my parents. I grew up taking care of my parents and so many tragic things happened to them. So... Vanilla Pipe Tobacco makes me feel incredibly sad and unsettled... but it's also very nostalgic and I almost want to give it a hug? I think that this is a very good tobacco scent. It's tobacco, crisp rolling paper, honey, vanilla, and woody, earthy undertones. It doesn't smell dirty or smoky or like an ash tray to me at all. I didn't really understand how a fragrance could be described as "chewy" before smelling this. Yes, it is chewy. Not too much vanilla or Tobacco, maybe some sweet grass, hay. This. The pipe tobacco on the initial spray is so realistic, and It smells almost damp, humid. It's rich and warm, yet supported by the incredibly smooth vanilla base. I'm a vanilla lover, and the vanilla really shines right along with the tobacco. If you love woodsy vanilla, but aren't too sure if you'll like the tobacco, I would definitely try this. It's so unique and intriguing. After blowing through a sample, I pounced on the 60ml EDP the minute it was restocked. The tobacco scent sticks around the whole time it's on my wrist (and like most other SS on me, it tends to stay close) but the blend of vanilla is so utterly perfect, it's just a wonderful harmonious scent. It also plays well with others, so if you want to throw it under a light floral or estate vanilla, it's dreamy. Edited to add: I've had the 60ml spray for a while now, and this is the one I reach for the most. It dries down into the most incredible vanilla. This isn't listed on the website with the other "vanilla based" scents, but it absolutely is. I'm going to order the rollerball for touch ups throughout the day because it does fade in a few hours and I crave it again. For reference, this, White Fox, Estate Vanilla, and Manor are my favorites from SS. THIS IS A MUST TRY. First off, I agree with the description of chewy. Yup. Great descriptor. Second, I have been on the hunt for a very specific tobacco note. When I was a young lad, I would go to house parties with my high school buddies. I never smoked, but lots of others lit up cloves, swisher sweets, and other assorted cigarillos. While despising cigarettes, I loved the fragrant ambiance that came when those wanna-seem-older teenage rebels puffed away. In grad school I hunted for that scent, and found it in a pipe tobacco called Better than Captain Black. I bought a bag I take sniff-hits from, but I also wanted a cologne that smelled like that. I still haven't found it, but VPT is close. This is one of my favorites. I love tobacco and vanilla. Outside of Solstice Scents, I also have and enjoy Tom Ford's Tobacco Vanille, Franck Boclet's Tobacco, Aramis Havana, 18.21 Sweet Tobacco Spirits, Spicebomb, Tabac Aurea ... you get the picture. This tobacco fragrance is the "purest" tobacco fragrance I have, in that it stays true to actual tobacco. In many of the fragrances I've tried that list tobacco I can't really tell a similarity that they all have in common. Are there that many different kinds of tobacco? It so confused me that I ordered Tobacco Absolute from Eden Botanicals, and now I feel confident that some "tobacco" fragrances are playing on some nuance that is not a true tobacco. VPT smells so similar to the tobacco absolute I ordered that I would not be surprised if Solstice Scents also sources from Eden Botanicals. VPT is the one I show to people who are surprised or disagree when I tell them tobacco is one of my favorite notes. I've yet to have someone tell me that they dislike it. I feel warm and cozy and smooth when I wear this. Like I'm wearing an invisible cloak woven from merino wool tobacco yarn. One warning: if you apply this one heavily (I have the oil), it can have a heavy dankness to it that overwhelms the pretty-brown-eyed appeal of tobacco.